Learn how to find out what song is being played on your radio or by a live orchestra. You can use mobile apps like Shazam, SoundHound, websites like Midomi and online social services to find name of the song. The other day I was listening to some instrumental music taken from some of the most famous American songs. As I am not very good with remembering lyrics of English songs, I was finding it difficult to put names on the songs that were being played. All the time, I was asking my friend, “Hey, what song is this?”. My friend, who knows more about song lyrics would always tell me the song name. But then I thought if there is an automatic way to find the name of a song? When I did some research, I found that it is pretty easy to know what song is being played. Technology has advanced, buddy! There are several music discovery mobile apps that can find song name if you provide these apps with music or tune of that song. Many of these mobile apps are available even free of cost. Let’s a take a walk through these song identifying mobile apps and websites and get the answer to the oft-repeated question of what song is this! No more troubling a friend in the middle of a song! Mobile Apps and Websites for What Song is This type of music discovery questions. All these mobile apps work using the voice recognition technology. You input a tune by recording it into the app and the app will run this tune through its database for a match. 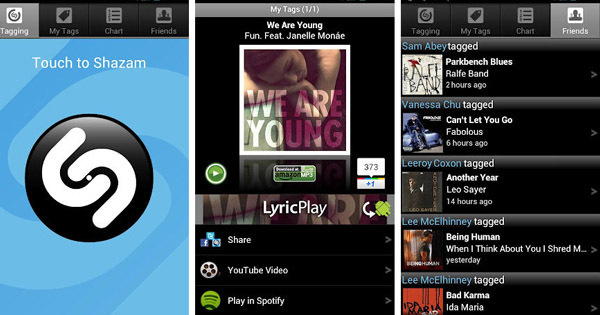 Shazam is among the world’s most popular mobile apps. Over 100 million people use this app every month. Shazam not only tells you name of the song but also it gives you related information like song lyrics, artist’s name, artist’s biography and discography. In Shazam app you can record a piece of the sound / musical tune. Shazam will capture this sound and run it through its database of about 11 million songs. The service will try to find a match for the acoustic fingerprints of the captured sound. As soon as it will hit a pattern match, Shazam will retrieve the song information and show it to you. How much does Shazam cost? Shazam is available for all major mobile phone platforms like Android, iOS, BlackBerry, Windows… and even for the Windows desktop PC. You can download Shazam and use it for free. But the free version will allow you to identify only 5 songs per month. If you want to remove this restriction, you can buy a license for Shazam Encore (it costs US $4.99 per month). Shazam mobile app can find the song name for you. It’s easy! Just download and install Shazam in your mobile phone. Then open Shazam app and hold your phone towards the music source so that the app can record the sound. Once you have given it enough input, say 15 seconds, press the Tag button and let Shazam discover the music information for you. If you do not have a mobile Internet connection, you can still record the sound using Shazam. Shazam will save all such sounds. As soon as the mobile phone will get Internet connection, the app will begin to identify sounds that you had recorded in offline mode. Did you know? By October 2014, more than 15 billion songs had been identified using Shazam’s technology! MusixMatch is the world’s largest database of lyrics. So, if you know a few words of the song, MusiXMatch will show you the complete lyrics. This service is very helpful when you know a few words from the song and you can’t figure out the title of the song. You can also make search on the basis of the artist’s name as well. I tested the MusixMatch app and found it to be pretty good for English songs. Catalog of songs in other languages (like Hindi) needs to be further developed. Nevertheless, the MusixMatch app claims to give you access to the world’s largest repository of the lyrics. If Shazam is the most popular music discovery app, the SoundHound is also not far behind. Moreover, SoundHound is completely free of cost!SoundHound is also available for all major mobile platforms. After downloading and installing it, you can hum the tune into SoundHound and the app will find the song that you were singing. It works pretty fast and shows you the song lyrics, artist information and album information. After finding, you can also play the full song and share it with your friends on Facebook and Twitter. Unlike Shazam, SoundHound is totally free. They earn their revenue through banner ads. If you want to remove ads as well, you can upgrade to SoundHound Infinity for a fee. SoundHound works both for music as well as voice search. Obviously, the success of voice search (i.e. the search based on your humming the song) depends on the clarity with which you would sing. If you want to use a computer to dig out information on a tune-stuck-in-mind, there are website services that can help you. Following are the best websites to find name of a song. Midomi is the website behind SoundHound mobile app. 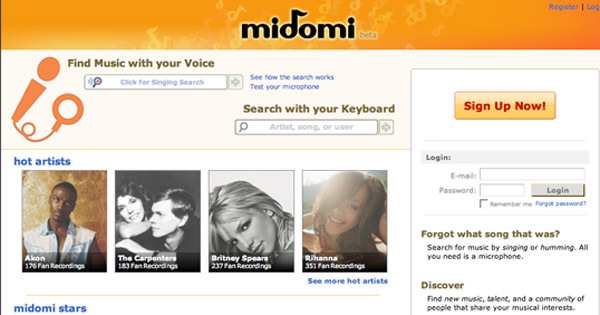 In 2009 Midomi was renamed as SoundHound —but they retained the web interface as Modomi and promoted the mobile app as SoundHound. Midomi is a cool website if you want to search for a song by humming. Just go to the website and hit “Click to Sing or Hum” button. The website asks you to sing for at least 10 seconds for better results. Just to test the website service, I attached a mike to my computer, opened the website and I hummed (yes, I did!) Mohammad Rafi’s Aaja Aaja Main Hoon Pyar Tera, and the website correctly identified the song. You can also give recorded music as input to Midomi. Midomi website lets you search for songs hummed by you. In order to get good results, you will have to sing a bit loudly. Also, try to keep the background sound (like that of a fan) to the minimum. Musipedia is a great initiative. It is based on the Wikipedia concept and anybody can enter or edit the music information stored in this website. What is even better with Musipedia is that it offers several innovative options to give music input for search. Even if you’re not doing any serious music search, you can still play around in this website. Because of this I would like to include this website in my list of interesting websites. Musipedia is a community driven website. Find Song Name with Mouse Dragging: There is an interface which allows you to drag your mouse and input notes of the tune that you want to search. Find Song Name with Single Key Tapping on Computer Keyboard: This method is not very accurate but still you might want to give it a try. Just tap any key on your keyboard to input a rhythm. 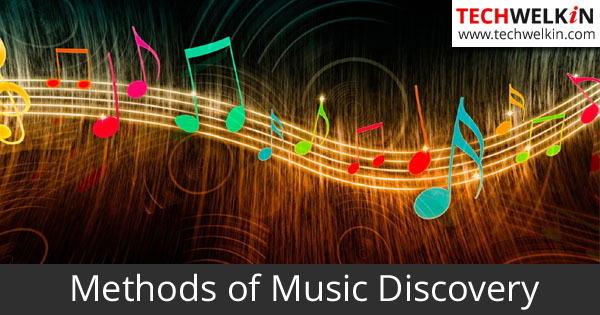 Musipedia will try to find the song that would match your rhythm. You can of course record your humming using a mic and then hit the search button to find the song name. 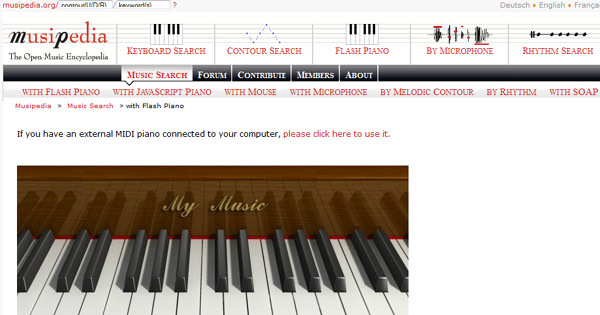 Nevertheless, Musipedia’s melody search is more useful for those who understand music. You can upload a small audio clip in AudioTag.info website. The website will compare the audio clip with the music in its database and tell you the title of the track. Although 15 to 45 seconds long music files are ideal but you can upload files of any duration. The music clip could be from any part of the whole song. The website will compare the music signature of the uploaded file with full songs. Technology works only as good as your input. Also technology is not yest as smart as humans. So, if the mobile apps and websites will fail to ID a song, you can turn to humans for assistance! There are social websites out there which can help you finding name of the song from bad to very bad tune recordings. On WhatZatSong, you can upload the music file and request the other members to help you identify the song. The community members will listen to the melody and give their guess on what that song could be. People upload sound samples recorded from whistling, humming, TV/radio blurting a noisy track out and what not! But human intelligence mostly trumps the automatic technology and you often succeed in getting the name of the song. As a community member you’re also expected to participate and help others in putting names to the tunes uploaded by them. Similar to WhatZatSong, the Name My Tune also is a community-oriented website that helps you in finding the name of a song. Website’s interface is very simple and intuitive. You can record a piece of music or you can sing the song you want to identify. The website will record it and run a search for the query as to what song is this. To make the search faster, if you know, you can provide information about the genre of the song and which era it belongs to. Name My Tune website also allows you to enter an email address to which it will send the response when the search is complete. That way, you don’t need to wait in front of your computer as the Name My Tune search works. To help others with what song is this type of queries, you can listen to the pieces recorded by other community members. You can ask the website to show you the yet-to-be-identified tunes of a particular genre or era. Then you can listen to recordings and give your best guess as to what that song could be. These are some of the options which can give and answer to your what this song is query. You can use mobile apps, websites or even community service to find the name of the song that’s stuck in your mind —and you would easily be able to to figure it out! I hope this article was useful for you. Thank you for using TechWelkin!